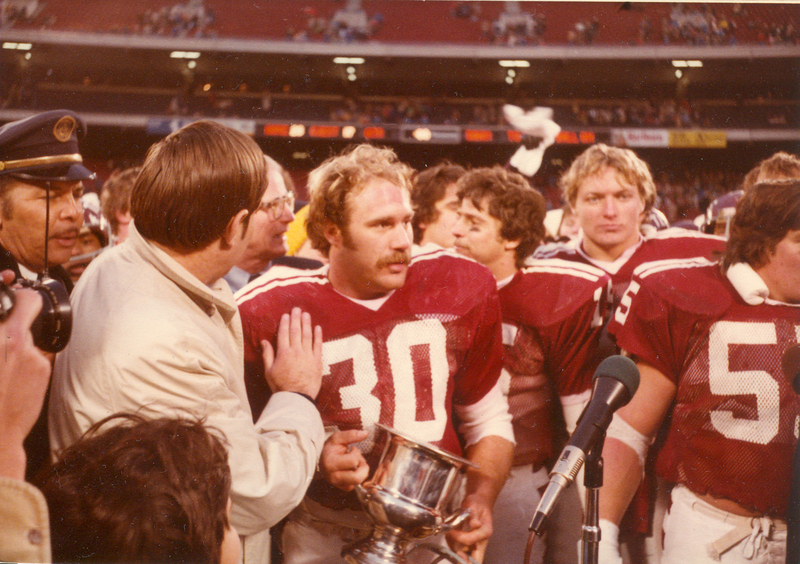 30 years ago, Temple defeated California for the Golden State Bowl II title. Courtesy Temple Athletics Running back Mark Bright accepts the Most Valuable Player trophy in the 28-17 victory over California in the Garden State Bowl II at Giants Stadium in East Rutherford, N.J. The newspaper clipping with the final Associated Press Top 25 poll from 1979 still hangs on former linebacker and team co-captain Mike Curcio’s refrigerator. Even as it yellows and frays at the edges, he can make out the football team’s No. 17 finish, ahead of teams like Michigan and Penn State thanks to a 28-17 win in the Garden State Bowl II against California. The 1979 Owls opened their season with three straight wins before a 10-9 loss to Pittsburgh, which finished No. 7 in the nation and made its way to the Fiesta Bowl. Temple rebounded with five consecutive victories for an 8-1 start. After a loss to Penn State, the Owls closed out their regular season with a 42-10 win against Villanova. Watching the Owls in that last game of the regular season was California coach Roger Theder. When the Owls players heard that, it immediately became bulletin-board material. Hardin and his staff watched film of the Golden Bears leading up to the matchup on Dec. 15 at Giants Stadium in East Rutherford, N.J. Hardin said they noticed two flaws that the Owls exploited early on in the game. “On defense, their [defensive linemen] would cross as they went toward each other, so a whole side would clear out,” Hardin said. “We got 21 points just by rushing the ball before they changed their defense. They were also a very fast team, so we used some misdirection plays. The Owls jumped out to a 21-0 lead in the first quarter, as Eastern College Athletic Conference Rookie of the Year Kevin Duckett rushed for two touchdowns. The Golden Bears cut the lead to 21-14 at halftime and then added a field goal early in the third quarter. But quarterback Brian Broomell led a 14-play, 78-yard scoring drive that culminated in a 5-yard touchdown pass to wide receiver Gerald Lucear. Running back Mark Bright earned Most Valuable Player after 112 yards rushing on 19 carries. The 1979 offense still holds five major records at Temple. The Owls scored the most touchdowns in a season, 50. Their 23 passing touchdowns and 26 rushing touchdowns top the charts, and their 4,815 total yards of offense led to 399 points. The Owls had plenty of defense as they beat Akron on Senior Day, 27-6.